A TORNADO WARNING... USUALLY ISSUED FOR 1 OR 2 COUNTIES AT A TIME... MEANS THAT A TORNADO HAS BEEN SIGHTED OR INDICATED BY WEATHER RADAR. PERSONS IN THE PATH OF THE STORM NEED TO IMMEDIATELY FIND SHELTER... PREFERABLY IN A STURDY BUILDING... BELOW GROUND IF POSSIBLE. IN HOMES OR SMALL BUILDINGS... GO TO THE BASEMENT OR STORM SHELTER... OR TO AN INTERIOR ROOM SUCH AS A CLOSET OR BATHROOM ON THE LOWEST LEVEL. GET UNDER SOMETHING STURDY... SUCH AS A HEAVY TABLE OR A BED. IN MOBILE HOMES AND VEHICLES...ABANDON THEM AND GO TO A STORM SHELTER OR STURDY STRUCTURE. IF THERE IS NO SUCH STRUCTURE NEARBY... LIE FLAT IN A DITCH RAVINE...GULLY...CULVERT...OR A LOW SPOT WITH YOUR ARMS AND HANDS SHIELDING YOUR HEAD. 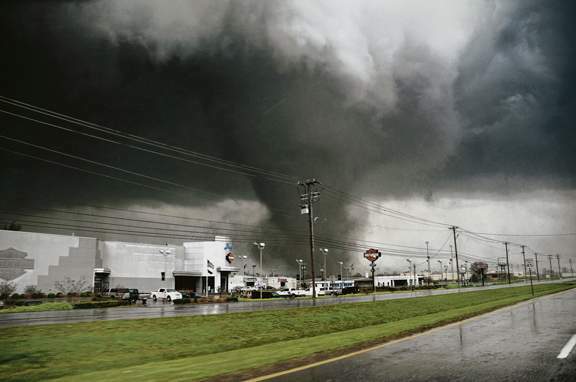 The state of Tennessee will conduct a statewide tornado drill at 9:30am today. The drill includes the sounding of outdoor warning sirens, but they will only sound if there is no ongoing inclement weather. MWN has partnered with Take Cover Storm Shelters of Fayette County to keep Mid-South residents safe in the path of the storm. We have become very familiar with Take Cover's high-quality product, as well as their outstanding customer service, and have no reservations about endorsing this fantastic company. You can learn more about Take Cover and their in-ground shelters, which are installed in a concrete slab such as a garage floor, at their website. Be sure to mention MemphisWeather.net when you contact Jessica!